4000 hours or February 2022!! Additional extended warranty upgrade available for purchase that extends until February 2028 or 6,000 hours. Galati Yacht Sales Trade 2017 72’ Viking Convertible has been outfitted and maintained by a professional crew and knowledgeable owner. The boat features Seakeeper gyro stabilizer, MTU Extended Service Coverage until 2022 on MTU M96 2635 HP engines, four staterooms, five heads, open galley arrangement, two (2) Onan 29 kW generators, watermaker, two (2) ice chippers, Spot Zero, custom tuna tube system and numerous other custom items as shown in this listing below. The 72 Viking Convertible is one of the finest sportfishing boats ever built. With stylish good looks, exceptional seakeeping qualities, fit and finish second to none and speeds that will get you out to your favorite fishing grounds and back in a hurry. vessel name: "Galati Yacht Sales Trade"
fuel capacity: 2594 G. 9819 L.
water capacity: 372 G. 1408 L.
holding tank: 202 G. 764 L.
Walking from the cockpit into the salon you will find an L-shaped sofa with custom table on the port side. This area also includes a large 55-inch Samsung flat screen TV, an additional 42” TV above dinette, entertainment center, custom Release high/ low salon cocktail table with storage, walnut interior, day head and custom décor. Forward is the large open walk through galley, walkaround galley island, barstools and dinette. The entire area is well throughout and provides for easy access for comfort and entertaining. Proceeding forward from the main salon you will find the companionway that leads to the large master stateroom with king berth and ensuite head on the port side. Laundry center in companionway. Moving forward is the VIP stateroom with crossover berths and ensuite head, port guest stateroom that features upper / lower berths with ensuite head. The forth stateroom/ crew quarters is located to port with ensuite head and engine room access. American luxury sportfishing and cruising motoryacht builder Viking Yacht Company was founded in 1964. 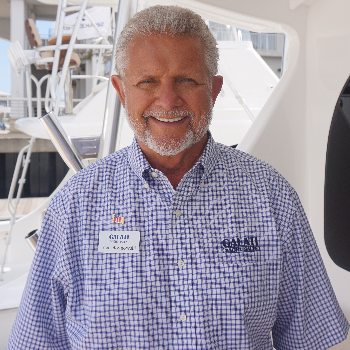 Today, this family-owned and -operated yacht company is a world leader in semi-custom fiberglass yacht production with over 4,000 boats delivered. 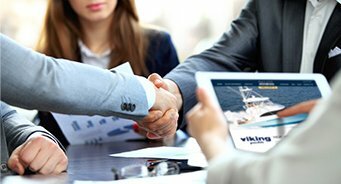 To the passionate owners of these yachts, the word “Viking” is synonymous with “excellence”. Model Viking’s proven 72 Convertible is designed and built for performance and luxury on long offshore fishing trips or cruises. It features a standard Open Bridge plan and four staterooms, each with private head. The master stateroom has a king berth. The salon is perfect for entertaining, thanks to the large, J-shaped sofa. The U-shaped galley has custom granite countertops, upper cabinets trimmed with crown molding, and a large walk-in forward pantry and spacious dinette. Overlooking the 209sqft cockpit is a full mezzanine that will let anglers watch the baits in comfort. Because we have one simple philosophy: Always take care of our customers, and one company-wide mission statement: Consistently exceed our customers' expectations. It’s a philosophy and mission that has been the core of who we are since the start of our company in 1970. Today, nearly 50 years, twelve locations, and three generations later, we have not wavered from our core and ethics. 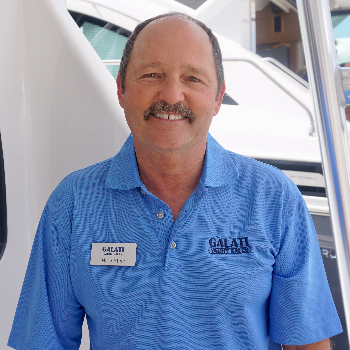 Each and every team member at Galati Yacht Sales is there for you every step of the way...before, during, and after the sale, to assure your time on the water in this 72 Convertible is filled with great memories.